Perry Block - Nouveau Old, Formerly Cute: Release the Bar Mitzvah Pictures! In the style of the Onion. Claiming that "alleged progressive" candidate for President U.S. Senator Bernie Sanders may well be a fraud, a charlatan, or even worse, a businessman!, former Secretary of State and Presidential candidate Hillary Rodham Clinton has challenged Senator Sanders to release the pictures from his niece Shelly's son Joel's Bar Mitzvah, celebrated on March 14, 2016. "Senator Sanders tries to pose as an authentic progressive by wearing shabby wrinkled suits and leaving his thin gray hairs uncombed," Clinton charged, "but the truth is that at his nephew Joel's Bar Mitzvah, Senator Sanders was well-groomed!" “He combed and sprayed his hair! He had a well-pressed Brooks Brothers suit on! He wore wingtips which were immaculately shined!" 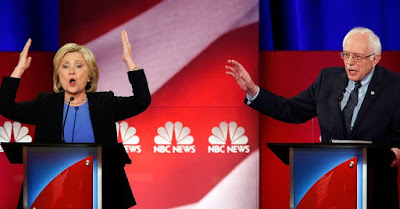 Secretary Clinton's vehement demand that Sanders release the Bar Mitzvah pictures is seen as a powerful counter punch to Sanders' demand that Clinton release transcripts of speeches she has given to Wall Street bigwigs. A clearly flustered Senator Sanders yesterday dodged the issue by asserting that Joel's Bar Mitzvah pictures are not yet back from the photographer. "What can I do?" Sanders shrugged " For all I know Shelly hasn't even picked out the proofs yet!" But even some of his supporters aren’t buying this. Bernie supporter actress Susan Sarandon has announced that if Joel's Bar Mitzvah pictures show Sanders dancing the hora with his hair unmussed, she may hora over to John Kasich. Additionally Secretary Clinton has released the pictures to every Bar Mitzvah she has ever attended. "I have nothing to hide," exulted Clinton," I always wear my characteristically frumpy pants suit and I plan to do the same at my granddaughter Charlotte's Bas Mitzvah ten years from now." "When, of course, I'll still be president," she added. If you liked this post you might also like Trump Stung by Mosquito, Lashes Out at Bug Chicks, Self-Deprecating Man May Really Be As Incompetent As He Says, and The Great Youth Serum Scam. If you hated this post, I hope Hillary Clinton forces you to release the pictures from your Bar Mitzvah and it turns out your fly is down in every damn one of them! Oh, I'd say that was as good as or better than the Onion :) Loved your "love/hate this post" options, too. LOL, I hope NONE of them win and we throw all the politicians out and start from scratch.